The following report is an abridged version of "Mechanisms Behind the Failure of the Jet Noise Barrier Structure" to be presented at the Conference Echo Red: Military Archaeologies and Architectural Trajectories on 31 May. The National Park Service has brought me to Guam to measure the progress of the jet noise barrier-structure as it falls into ruin. The problem is essentially one of documentation. How is ruination measured and tracked? A forensic engineer typically studies the mechanism behind collapse, not the ruins themselves. A forensic engineer is asked to be a witness to some failure which has already occurred and to document how and why it occurred. In the instance of the jet noise barrier, failure is widespread and pervasive——indeed, it is unstoppable. There is not a ‘wrong’ to make ‘right’, no particular wound to be healed, and no representation to be made in a legal court which will determine fault. 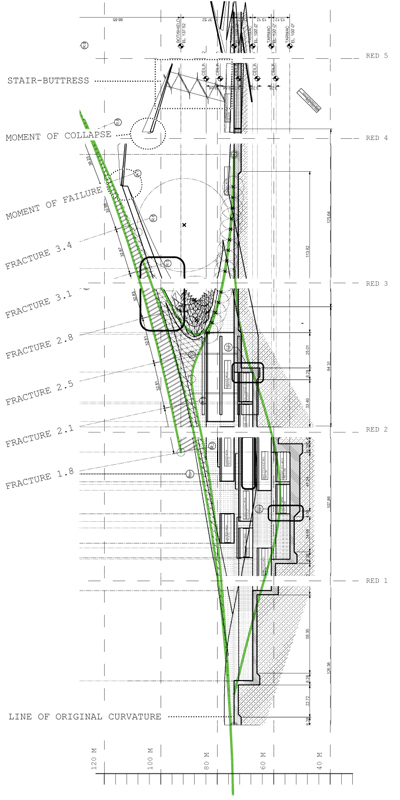 What I am instead going to show is that fracturing was intentionally built into the structure and that this has enabled the piecemeal reclamation of this militarized space. Fractures are inherent qualities in military space. 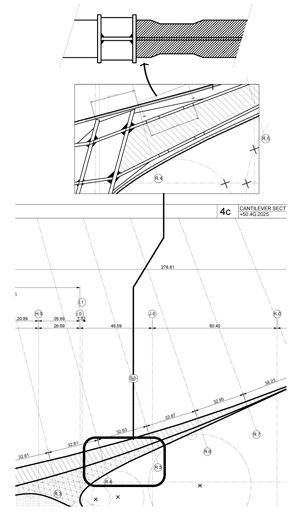 Fracture as a design guideline can be exhibited in military architecture throughout history. Considering the citadel, the ideal fortress is not necessarily hermetically sealed from its surroundings. As siege machinery and disciplined armies posed greater challenges to besieged cities, the notion of a hermetically sealed fortress became obsolete. At ancient Syracuse, Dionysus planned with cunning, developing a set of flexible walls that both took advantage of a natural plateau and, with strategically placed openings in the defensive walls, permitted the besieged to strike at the enemy and return easily to safety. Now extending to the operative quality of fortifications, “elasticity and mobility have replaced the old principle of defense by inert mass.” 1 Even the 4,500km long line of Atlantikwal bunkers were designed with the understanding that an invasion would inevitably occur and the invading forces would likely gain a foothold on the continent. An inland “wall” of bunkers formed secondary and tertiary lines of resistance which would, in theory, repel an attack. The same principle is at play here on Guam, where the military took up a ‘permanent siege’ of the island’s population, under the guise of providing jobs and security. The wall erected along the perimeter of the base purportedly blocked jet sound. However, the real purpose was to keep the island’s population from seeing and hearing the daily training exercises and other activities of the military. It functioned as a ‘ha-ha’——a form of deception in landscape design which produces a boundary by means other than obvious fences and walls. A new horizon was generated. This simple mechanism provided a visual depth, penetrating the actual boundary of military space. Referring to the forthcoming ornithologist's report, wildlife habitat also provided a false depth. 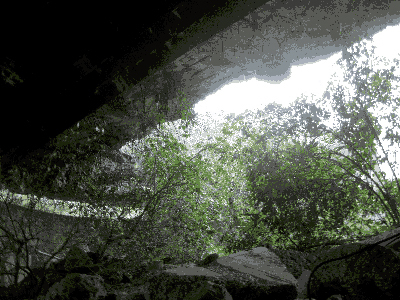 Birds occupied voids, accessed through fractures in the structure and established a vibrant limestone forest ecology. These factors contributed to the ‘defense’ of the military base by means of built-in fractures. In some cases, however, the occupation of fractures multiplied them, increasing the risk of structural failure. Fracturing is not synonymous with failure; fracturing only exhibits the potential or likelihood for something to fail. The International Institute of Forensic Engineering Sciences defines failure as the “inability of a component, structure, or facility to perform its intended function.” This could lead to, for example, structural collapse, excessive vibration, and poor acoustics. It is possible, then, that the structure could retain fractures while still performing its intended function, to attenuate jet sound. First, did the structure perform its intended function? The concrete-limestone complex was both a logical construction solution and an appropriate material choice for noise absorption. The particular demands of absorbing jet sound were further met by the presence of limestone coral as an aggregate in the concrete. 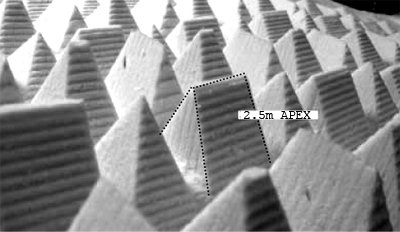 With pores exceeding 180 microns within an average aggregate size of 750 microns, the composition is improved several-fold over standard concrete in sound absorption. The military deemed it important both to absorb sound with physical mass and to scatter reflected sound through a rough aggregate finish surface of the concrete. 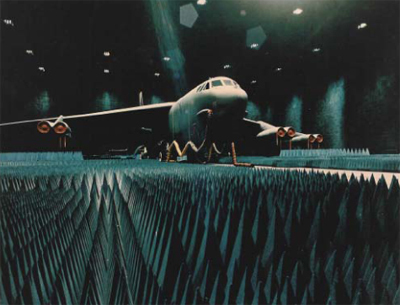 The military engineers appropriated wave-energy reflecting geometries such as those found at the Benefield Anechoic Facility on Edwards Air Force Base [see Fig. 4-2]. Extensive studies revealed that the jet noise barrier, due to the curve and cantilever desired for structural purposes, would reflect both sound and radar waves back towards the occupied areas on the base. The precedent of Nicholas Grimshaw’s British Airways office at Heathrow Airport was considered for its “radar invisibility.” Therefore, at the moments of greatest reflection, the noise-scattering geometry became most pronounced, exceeding base to apex distances of 2.5 meters. [see Fig. 4-3] The berm successfully buffered the community immediately adjacent to it from noise propagated across the military property line and it reduced the noise reflected back into the base from the aircraft sources. The structure adequately supported the design dead-load, but the additional loads taken on following the departure of the military are the subject in question. Fig. 4-4 points to the visible failure evident in the cantilever. The cantilevered wall succeeded in suppressing the transmission of sound from the inside of the base to the exterior, but this cantilever has proven to be unsustainable. Just the other day I was riding in a Jeepney from the Bravo Green entrance to Delta White station, and we heard a thundering crash. The driver pulled over and with the other passengers we all gazed out to locate the source of this colossal noise. The crash was followed by a series of grinding thuds, and sharp snaps. There, across the expanse of jungle, an entire ridge was caving in, dropping to the forest floor with an enormous mass of live vegetation. Birds lifted from treetops for kilometers in all directions. Following this startling experience, no seemingly natural feature can be regarded as stable in the Park. The landscape is in flux, the processes of which demand accountability. 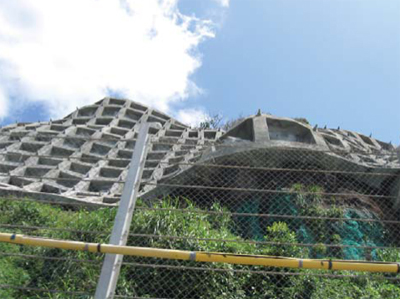 The military has abandoned the structure and left it to the island residents to maintain, not unlike the sudden departure of the military from Clark Air Force Base and Subic Bay Naval Base in the Philippines in 1991. The eruption of Mt. Pinatubo coupled with unrest building in the Philippine Senate over the US bases resulted in the military’s exodus. In the case of the Philippine bases, the infrastructure left behind was in pristine condition (though covered in several feet of ash from the eruption of Mt. Pinatubo). 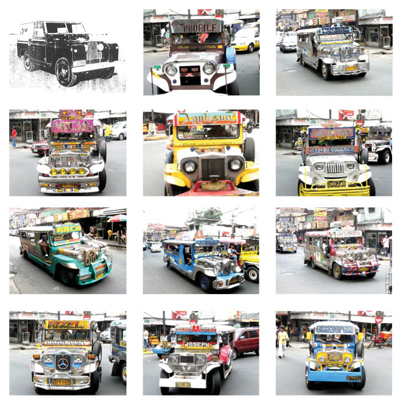 The Filipinos found creative ways to repurpose the roads and buildings, just as they converted the surplus Jeeps from WWII into the Jeepney, the most widespread mode of transit to this day in the Western Pacific. [see Fig. 4-5]. The bases were converted to ‘Freeport Zones’ with light-industrial business parks, duty-free shops, hotels and casinos. The sudden departure of the military left a vast wealth of recyclable infrastructure. On Guam the departure was also sudden but the action of the Department of the Interior to reclaim the land as a National Park jeopardized the noise suppressing berm. The transfer of land froze development in and around the berm, which had two results. First, a lack of economic development removed any source for upkeep of the structure. Second, the lack of development led to exponential growth of vegetation on and within the structure, adding to the dead load on the cantilever (refer to zone Red-4 in Fig. 4-1). My estimations show that at least 25% of the cantilevered sections have collapsed, with another 45% at risk of imminent failure. The military planned for the failure of the structure, as such an extreme cantilever would have to be planned to collapse in a manner that sacrificed certain parts for the greater whole. 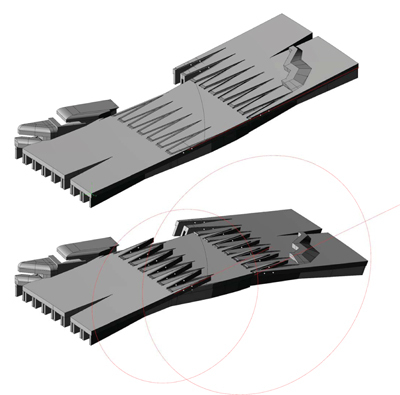 The military controlled the zones of fracture via ‘dogbone’ connections at intervals along the cantilever, with increasing chance of failure as you move up to the end of the cantilever. [see Fig. 4-6] The ‘dogbone’ is used in standard construction to allow a beam to fail while leaving columns—the primary mode of support—intact. This process is standard in Japanese construction where it has been employed by such prominent construction firms as Kajima, the designer of the project in question. These built-in flaws in the concrete are accompanied by adverse effects of the collusion between Japanese concrete contractors and the government. Considering other concrete construction built in Japan around the same time, Japanese concrete firms have a tendency to over-build in order to maintain their government-backed construction regimes. Land retention systems in Japan, for example, are often designed as heavy waffle grids which are molded to the topography and cover it to a uniform structural depth. The construction is heavy-handed [see Fig. 4-7]. As one Japanese construction expert explains, it’s like “shooting goldfish with a bazooka.” The land retaining system is related to the jet noise barrier because of the waffle-grid system. 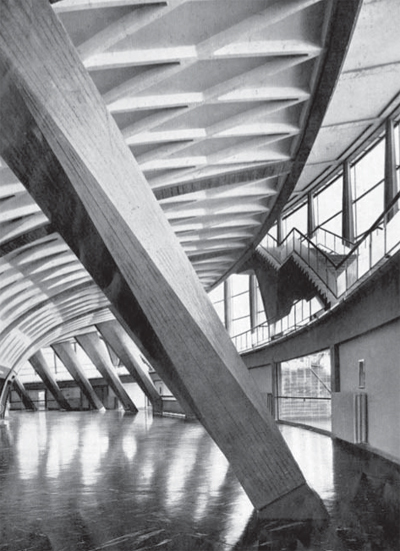 Military engineers developed a system which is a marriage of the organic waffle-grid exhibited in the Japanese land retention example and the elegant reinforced concrete structures pioneered by Pier Luigi Nervi [see Fig. 4-8]. The additional concrete mass produced a structure with a high dead-load. Given the risks both of earthquakes and super-typhoons, such a massive structure could not be designed to withstand tremendous forces, leading to the engineering of its failure. Observing the moments of failure, several questions arise. How large do the cracks become before failure? Can we predict this entropic process to any degree? The process of collapse begins as steel in the cantilever gradually loses tension over time. Increase in dead-loads as noted above produces larger uniform loading . The ductility of the steel then permits such a great deflection that entire sections of the barrier become unsustainable and the ‘dogbone’ moment produces failure. The break, however, is gradual, with sudden bursts of progress, until the section finds support from the ground below or by artificial means. 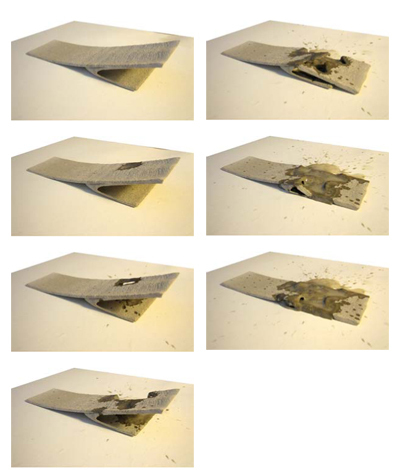 I performed a series of tests on models made of a similar composite, using a controlled water drip to induce the failure of the cantilever in the model. [see Fig. 4-9] The water drip is an excellent means of testing how this model will behave because it is the absorption and retention of water which induces both spalling in the concrete and the dissolution of limestone. We can only predict the rate or tendency for this process to occur, while core sampling can verify these estimations. The force of ruination is accelerating, as fractures increase and spread from the apex of the cantilever to the thicker base sections. The Park Service wants to deploy some buttressing prototypes to protect visitors from random collapse, beginning at the apex. The buttresses would receive the failing cantilever as it gradually fails and is lowered to the jungle floor. This carefully choreographed curation of the ruins is producing inroads into the space. Literally the architecture of buttresses provides scaffolding which serves both a structural function and a programmatic one. Visitors to the former military base are able to engage with processes of entropy up-close, rather than simply gaze from afar. Only through this intimate reclamation can the space truly become demilitarized. can you post some photos of the wall? Mr. Lehrman: stay tuned for photos of the wall at Echo Red! And thank you for posting the Shibata images. I believe the engineers on Guam saw those and found a certain beauty in them. It's like the death of a hillside, preserved in concrete.